Why do I oppose the Trader Tax? Because it is unfair on so many levels. I've touched on my opinion of the roots of the financial crisis before, and everyone has their own thoughts. For now I'll just restate my view that traders did not cause the financial crisis. Following are some aspects of the transaction (transfer) tax which I consider unfair: Justification for the transaction tax put forth by Rep. DeFazio is that "Wall Street" benefitted from the financial "bail-out" so they should pay for it. Are traders "Wall Street?" I don't personally know a trader who has received money from TARP or other programs. Advocates of the bill will maintain that traders benefit from avoiding total financial collapse. I maintain that everyone benefits from avoiding total financial collapse. So forcing traders to pay for the "bail-out" is unfair. Another level of harm is the unjust targeting of active traders. There's a moralistic bent to the language Congressman DeFazio has used to describe active traders. He calls them gamblers and churners. At one point he stated that someone who placed more than one trade in a day was a "churner," and I believe he thinks at some level that day-trading and scalping is immoral. He never recognizes the contribution to liquidity by this group of traders, and seems willing to punish them especially severely, killing their livelihoods in some instances. So punitive taxation of particular traders is unfair. A trader in highly leveraged instruments will have a lower tax than your average Joe and Jane who simply trade stocks and bonds. Trading with some kinds of financial tools allows control of relatively large amounts of assets with a low transaction cost. Since the tax applies to the transaction cost, it makes the tax highly regressive. "Islander" alluded to this in his post earlier in the thread. So the tax may have the effect of encouraging some forms of speculation as well as unfairly punishing ordinary traders who don't use those particular instruments.. So the transaction-cost basis of the tax is unfair. I think at some level the sponsors of the bill want to reduce the amount of speculative financial activity. Yet this bill doesn't target instruments of speculation which draw liquidity away from stocks and bonds. It's a form of carpet bombing – a common practice before the advent of smart-bombs – which destroys nonmilitary facilities and kills civilians. The proposed tax lacks precision, and will harm all areas of financial activity, even the ones they claim to favor. Precision targeting would cause less collateral damage. So indiscriminate targeting of the tax is unfair. These are some of the reasons I think the Trader Tax (detailed in HR 1068 and referenced in HR 676) is unfair. I urge you to form your own opinions. If I've helped you see something new, please make it your own. Talk to your friends about these issues. Above all, contact your Congressional Representatives and Senators. If you've already done it, do it again with better reasoning and more arguments. The advocates of the legislation want you to knuckle under and feel guilty, even if it is unreasoned. They want you to feel ashamed. There is no need to feel shame! Alton 3-14-09 PS – I know I'm stepping on some toes in the community. If they are yours I urge you to think of the bigger picture. The legislation will hurt us all. It needs to be stopped. Edited by Alton, 14 March 2009 - 12:02 PM. Several years ago I think the phrase was, "My bad!" I don't know what they say now. When I posted earlier today, I would have sworn I heard Representative DeFazio chime in with "churn" at two trades a day. Actually he never said what his idea of "churning" was, despite being asked. So...in the post immediately above, I retract the first half of the fourth sentence in the paragraph which begins "Another level of harm...." The last part of the fourth sentence, beginning with, "I believe" is just my opinion, and I still think it's valid. Perhaps the interviewer felt the same way. I don't know the reason, but this video seems to display properly for me only on Internet Explorer. If you have trouble viewing it, it's worth some effort. If you're seeing it for the first time and think the congressman scored some points, please reread the above post on the unfair aspects of the proposed tax. PS - A constant irritant is Representative DeFazio's statement that the tax in 1932 did no harm. How can he possibly know what would have happened without the transfer tax? Ah well. Edited by skott, 17 March 2009 - 09:15 PM. I first heard the word "churn," as it pertains to investing, in the late eighties. It occurs when an unscrupulous broker makes multiple trades in an account with the sole purpose of generating commissions. I think many people know the word in that context, so when Representative DeFazio uses the word in describing traders, he's invoking some of the negativity that goes along with the word. Nasty. The congressman may be well meaning, but it seems to me he's using underhanded semantics. PS - I may have some new information to post here tomorrow after the change to the new servers. Hopefully the thread will stay pinned here. How do we respond to false advertising? Suppose a drug company claims a 100 percent cure rate for "what ails you" but we discover the astonishing rate applies to only 1 percent of their customers. Suppose an investment guru claims a 15% return each and every year (think B. M.) and we find it to be untrue. How do we punish these false claims? Now suppose it's a congressman pushing a tax bill in 2009. Part of the justification, and much of the rhetoric used to promote the bill are the contents and results of a prior tax bill, specifically the "Revenue Act of 1932." What do we do if we find the claims are false? In an interview on FoxBusiness.com (3/4/09) Representative Peter Defazio (referring to notes) states "...1932, when Congress doubled the then tax of .2 to .4 percent." This occurs 1 minute 15 seconds into the video. Link In fact, in 1932 there were two versions of the Revenue Act, one from the House and the other from the Senate. The following image is part of a TIme magazine article from May 23, 1932. The above image contains only two paragraphs and a table from the text. In the online version of the article (Link) the columns in the table don't align. In the boxed area showing "Stock Transfer" proposals, neither of the legislative bodies proposed a tax as high as the .4 percent (40 cents per $100) Rep. DeFazio mentioned. Which version of the tax was implemented? There were thirteen hours of non-stop negotiating between House and Senate leaders. 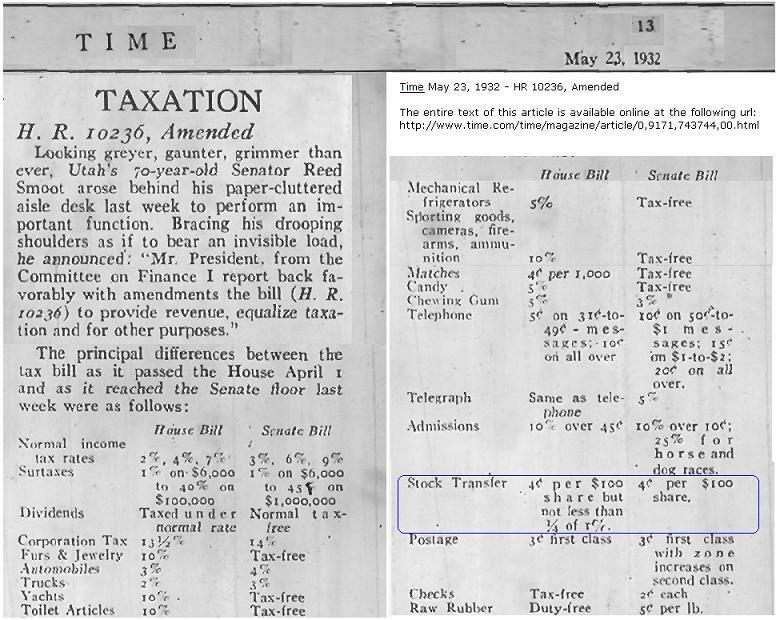 The Time issue (Link) of June 13, 1932, states, "In the trading across the table, Utah's grey old Reed Smoot, Chairman of the Senate Finance Committee... won... a cut in the stock transfer tax...." So the Senate version prevailed on that particular aspect. As presented in the May table, the tax rate was 4 cents per $100 share. And that is .04 percent, not the .40 percent Congressman Defazio claimed in the interview. That's a huge difference. So what do you do about false advertising? As you answer this for yourself, don't think of what has (or hasn't) been done in the past. In 2009 we seem to be demanding a new standard for accountability in many areas. I believe this should include our politicians. PS - A reminder here that other Congressmen have signed on as cosponsors of HR 1068. Think of them as misinformed. Note: The cosponsor information is current only as of 2009-03-07 and can be found at govtrack.us. Edited by Alton, 22 March 2009 - 08:56 PM. Nothing really new in this post, but I want to clarify a few things. It would be peachy if I had someone to scrutinize images (and text) before I posted, but it's just not gonna happen. This morning I noticed that in piecing together the visual edit of the May 23, 1932, "TIme" article, I duplicated a portion of the table. If I were a congressman I would have a staffer who would notice that beforehand. Here's the corrected display. Sorry I can't somehow insert it into my post from yesterday. I mentioned to Monk in a message last night that I hesitated before including the list of cosponsors of the House bill in the earlier post. I was not trying to show their party, and regret not editing out the notations. I was simply trying to show that Rep. DeFazio is not acting alone. If we start talking about political affiliation, the thread will evolve into mudslinging, and the topic could be banned. So, let's please try to leave out discussion of partisanship. I think traders (and most investors) of all parties are with us. Alton 3-23-09 PS - Lest anyone try to argue that postage (for example) was 3 cents in 1932, but is 42 cents today (using that as justification for a higher tax on stock transfer) remind them that equities which increase in value are subject to stock splits. There's no equivalent altering of value for postage or any commodity that I know. Edited by Alton, 23 March 2009 - 01:02 PM. what does the "D" mean? Edited by jdjimenez, 01 April 2009 - 11:01 PM.